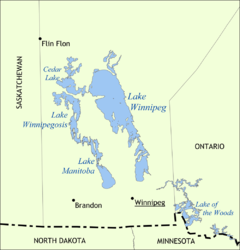 Loch Winnipeg is a lairge, 24,514-square-kilometre (9,465 sq mi) loch in central North Americae, in the province o Manitoba, Canadae, wi its soothren tip aboot 55 kilometres (34 mi) north o the ceety o Winnipeg. ↑ "Lake Winnipeg Quick Facts". Retrieved 14 July 2014. This page wis last eeditit on 27 Februar 2019, at 22:14.